The heart of every Hydro-Pac gas compressor is a hydraulically driven intensifier. An intensifier consists of a hydraulic cylinder (motive cylinder) coupled with two gas cylinders. The most common arrangement is a hydraulic cylinder in the center with a gas cylinder on each side of the hydraulic cylinder. In operation, the force of the hydraulic pressure acting on a hydraulic piston is balanced by gas pressure acting on the gas piston. 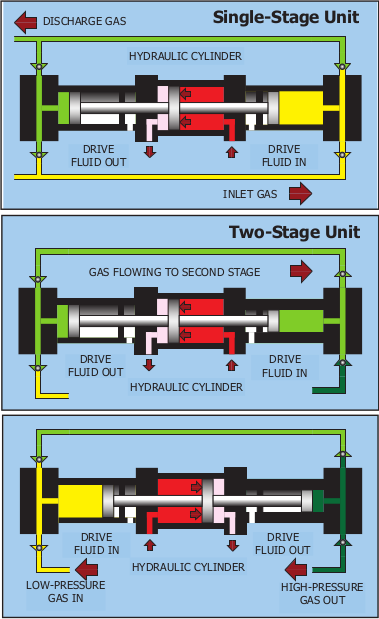 As the hydraulic cylinder strokes, gas is compressed and displaced from one gas cylinder while simultaneously filling the other gas cylinder. Intensifier designs are flexible and multiple arrangements are possible. The most common arrangements are double-ended machines that are either single-stage or two-stage units. Single-ended units are also available. Single-stage compressors are commonly used to take advantage of high inlet pressures. The flexible design of the Hydro-Pac intensifiers, allows single-stage units to operate with very high inlet pressures to produce discharge pressure with each stroke. The compression ratio for a single-stage machine is limited to approximately 8:1. Two-stage compressors are used when the compression ratio exceeds 8:1. The principle of operation is very similar to the single-stage units. The main difference is that the diameter of the second stage gas cylinder is smaller than the first stage gas cylinder. The interstage cooling that occurs between stages allows higher overall compression ratios. The compression ratio for a two-stage machine is limited to approximately 64:1.